Eagle warriors or eagle knights (Classical Nahuatl: cuāuhtli [ˈkʷaːwtɬi] (singular) or cuāuhmeh [ˈkʷaːwmeʔ] (plural)) were a special class of infantry soldier in the Aztec army, one of the two leading military orders in Aztec society. 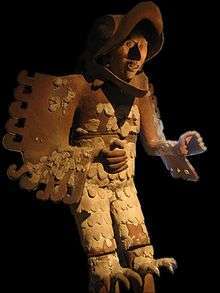 They were a type of Aztec warrior called a cuāuhocēlōtl [kʷaːwoˈseːloːt͡ɬ]. The word cuāuhocēlōtl derives from the eagle warrior cuāuhtli and the jaguar warrior ocēlōtl [oˈseːloːt͡ɬ]. These military orders were made up of the bravest soldiers of noble birth and those who had taken the greatest number of prisoners in battle. Of all of the Aztec warriors, they were the most feared. Eagle warriors, along with the jaguar warriors, were the only such classes which did not restrict access solely to the nobility, as commoners or, in Nahuatl, "mācēhualli" [maːseːwalːi] were occasionally admitted for special merit. The eagles were soldiers of the Sun, for the eagle was the symbol of the Sun. The life of Aztec warriors was one of constant battle, as the primary purpose for this continual warfare was to take prisoners to be sacrificed to their gods. As the Aztec Empire expanded, however, the expansion of the empire in size and power became increasingly important. In current culture, the eagle warrior is a representation of the Aztec culture, and therefore the Mexican tradition. Some companies use the eagle warrior as a symbol that denotes strength, aggressiveness, competitiveness, and remembrance of the ancient cultures of Mexico. AeroMexico's logo, for instance, shows a cuāuhtli. All Aztec boys, both free commoners and nobility, learned about weaponry and warfare as part of their basic education. Until the age of fourteen, the education of children was in the hands of their parents, but was supervised by the authorities of their calpulli. Periodically, they attended their local temples, which tested their progress. However, only the best students could progress to become eagle warriors, as they are considered as one of the nobility in Aztec society. The empire was split in pieces: kings (thought to be gods), nobles, generals, priests, peasants, and finally slaves. Pre-Columbian Aztec society was a highly complex and stratified society that developed among the Aztecs of central Mexico in the centuries prior to the Spanish conquest of Mexico, and which was built on the cultural foundations of the larger region of Mesoamerica. Politically, the society was based around the independent city-state, called an altepetl, composed of smaller divisions (calpulli), which were again usually composed of one or more extended kinship groups. Socially, the society depended on a rather strict division between nobles and free commoners, both of which were themselves divided into elaborate hierarchies of social status, responsibilities, and power. Economically the society was dependent on agriculture, and also to a large extent on warfare. Other economically important factors were commerce, long distance and local, and a high degree of trade specialisation. At the age of 17, young Aztec men became warriors and entered formal military training. The recruits were expected to be brave and noble. Those who were of noble lineage also received training in religion, politics, or history by the priests. To achieve adult status, a young man had to capture his first prisoner. Aztec warriors could move up in ranking by capturing enemies. After having done 20 or more great deeds (capturing foes to be used as sacrifices), they were eligible to become either a jaguar or eagle warrior. The warriors used a number of weapons, including an atlatl, bows, spears and daggers. The Aztec blades (macuahuitl) were made by setting obsidian within wood. The stone was sharper than steel but quickly lost its edge. Firestones were flung at enemies using slings made of wool. Most Aztec weapons were intended to stun and capture opponents rather than to kill them. The uniforms of eagle warriors signified both courage on the battlefield and physical strength. The Aztecs wore a lightweight close-fitting breastplate which suited the Mesoamerican climate. Their shields were round, brightly coloured and decorated with feathers. A warrior's legs would be covered with leather strips, an archaic version of greaves. As headgear, eagle warriors wore the heads of eagles, including an open beak, and used eagle feathers as adornments. Their slings were likely made from maguey fiber either a type of ixtle from one of the agave type maguey plants such as henequen (Agave fourcroydes). The Eagle Warrior Temple is located in Malinalco. The temple sits upon a hill and is completely carved out of bedrock. The temple is a circular structure with an entrance containing 13 steps, and includes two jaguar sculptures. The entrance to the temple was a carved open mouth of an Aztec earth monster. The temple has a long extended bench that covers half of its inner chamber. There are carved sculptures on the bench of eagles and a jaguar. In the center of the inner chamber there is a giant carved eagle on the floor. Some believe the centre eagle would be used as an altar or throne. Surrounding buildings around Malinalco contained several murals depicting the life of a warrior. In additions there were murals of dancing eagles and jaguars within structures in Malinalco. Garcia Payon, Jose. Revista Mexicana de Estudios Anthropologicas. Los Monumentos arqueologicos de Malinalco. 1947. Smith, Michael E. The Aztecs. 3rd Ed. West Sussex: Blackwell Publishing, 2012. 1 2 Sánchez-Murillo, R. (2012). La palabra universal. Ricardo Sánchez-Murillo. Retrieved September 5, 2012, from link.